Moscow, The 49 years old Malaysian king, got married with the Russian beauty, 25 years old ex Miss Moscow. 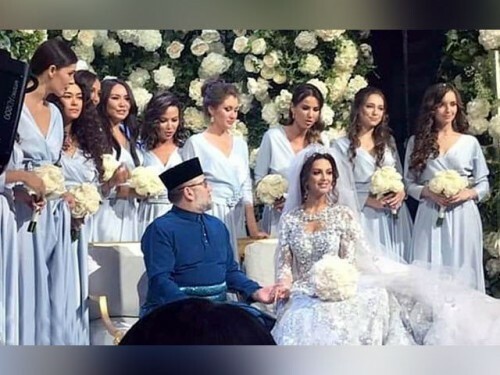 The Russian woman, Oksana Voyevodina got married with King Muhammad V in Moscow. Before her marriage, she embraced Islam and she has adopted the name of Rihana for her. After getting married with the king of the country, she has gained the title of queen and first lady. However, they did not reveal when and where they met for the first time. Malaysian King Marriage with Russian Woman. A royal ceremony was conducted in a big hall in Moscow, in which the Halal food was served and alcohol was not allowed there. The bride said on this occasion that she wanted that her husband might be rich and also appointed on any big post. According to the Malaysian newspaper, ex Miss Moscow embraced Islam on 16 April 2018 and she shared a picture with Hijab on the social media.